The Polish prime minister personally invited Ukraine’s president to attend the 70th anniversary of the liberation of Auschwitz on Monday, despite Polish authorities denying they send traditional personal invitations at the highest level. 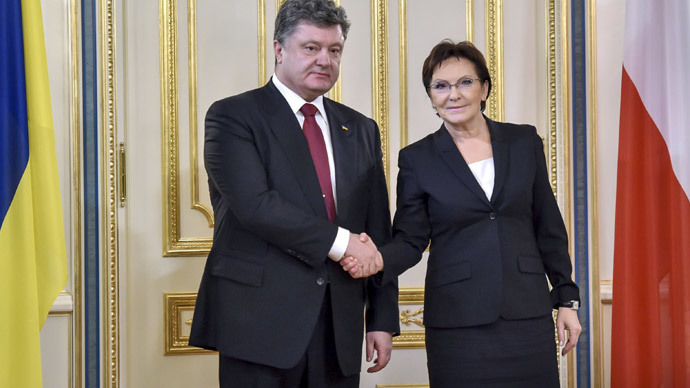 Polish Prime Minister Ewa Kopacz expressed hope that Ukraine’s President Petro Poroshenko would attend the ceremony in Poland that will mark the 70th anniversary of the liberation of the Nazi death camp, Auschwitz, PAP news agency reported on Monday. “I’d like to ask whether the president will honor us during the celebrations of the 70th anniversary of the liberation of the Nazi concentration camp at Auschwitz-Birkenau,” Kopacz said at the meeting with Poroshenko. She added that Poland is ready to welcome Ukrainian soldiers, who fought in the line of the First Ukrainian Front and participated in the liberation of the camp. It comes as no specific invitations to the event have been issued, as this year Polish authorities passed this duty to the Auschwitz Museum and the International Auschwitz Council. The organizers of the ceremony stated that all nations, contributing funds to the site, had been asked if they were going to participate – yet, without personal invitations. A week ago, spokesman for Russian President Vladimir Putin, Dmitry Peskov, said the country’s leader wouldn’t attend the event, as he hadn’t received any invitation. He added that Putin's schedule is very tight and he doesn't have a window for travel. “It would be only natural for Poland to invite Vladimir Putin to participate in the ceremony to mark the anniversary of liberation of Auschwitz, because the Red Army is the one that liberated Auschwitz,” Efraim Zuroff, director of the Simon Wiesenthal Institute, the Jewish human rights organization, told RT. President Putin delivered a speech at the ceremonies marking the 60th anniversary of the camp's liberation, in 2005. This year, the organizers of the event say the speeches won’t be made by political leaders, but by former prisoners. “If the ‘new freedom of speech’ prevails in regard of WWII, very soon everyone will think that Auschwitz and the whole of Europe was liberated by the US – and Obama’s granddad,” Russian MP Aleksey Pushkov, the head of the foreign affairs committee in the Russian Parliament, wrote in his Twitter microblog on Saturday. The commemoration of the liberation of the Nazi death camp is set to take place on January 27, 70 years after Soviet troops liberated the Auschwitz concentration camp in 1945, where about 1.5 million victims were imprisoned, many of them Soviet citizens.